Istanbul Stock Exchange, locally known as Borsa İstanbul (BIST) is a stock exchange located in Istanbul, Turkey. It is the sole exchange entity of Turkey formed in April 2013, combining the former Istanbul Stock Exchange, Istanbul Gold Exchange and the Derivatives Exchange of Turkey under one umbrella. As of March 2016, more than 370 securites are listed on the Istanbul Stock Exchange and the total market capitalisation of the exchange stood at US $218.21 Billion. BIST 30, BIST 50 and BIST 100 are the three main indices of the Istanbul Stock Exchange. If you are from Turkey or if you are trading in Istanbul Stock Exchange, then I am sure you might be searching for Istanbul Stock Exchange Holidays, Istanbul Stock Exchange Trading Calendar. Below we have provided Istanbul Stock Exchange 2019 / 2020 Holiday Calendar. Note : Istanbul Stock Exchange (BIST) 2020 Holiday Calendar Coming Soon. 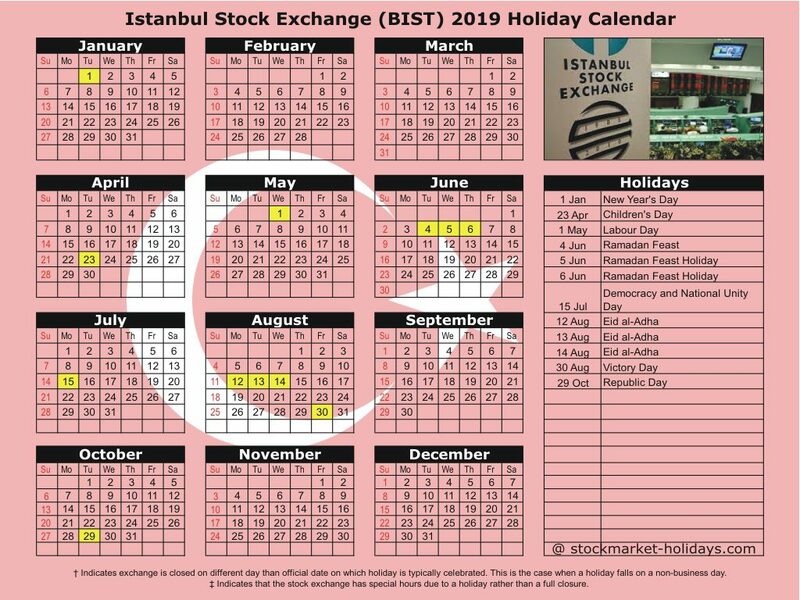 Note : Istanbul Stock Exchange (BIST) 2020 Holiday Calendar PDF Download Coming Soon. Live Quotes and Charts, Company Profile, Results, Corporate Announcements and all other information of all the securities trading on Istanbul Stock Exchange will be available on official website of the exchange.